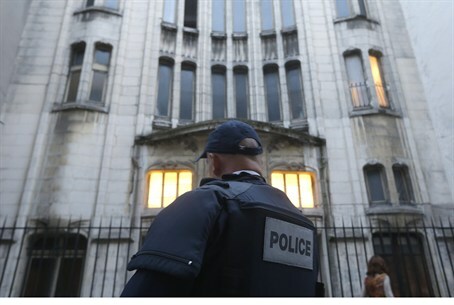 French Interior Ministry ups security at Jewish sites following stabbing; details still developing. Two Jewish men were attacked outside Paris Saturday night, French Interior Minister Bernard Caseneuve announced Sunday, as they were leaving a Creteil synagogue. Caseneuve ordered police around France to increase security at Jewish houses of worship and other Jewish establishments, the Ministry stated. He condemned the attacked with "utmost severity." Very few details are available on the attack. Sources told Israeli small-time news site 0404 Sunday morning that three French Jews were attacked - not two - and identified them as the synagogue's treasurer and his two sons. All three have been hospitalized, according to the report. The men were stabbed just hours after a gunman entered Brussels' Jewish Museum Saturday afternoon and began shooting, killing three people - including two Israelis - and critically wounding another. Several Jewish leaders have fiercely condemned the attacks, warning as well of growing anti-Semitism in Europe.